If you’re a fan of HuesofMan, you know I sort of have this little thing for Gucci. Okay, it’s more like an obsession. Over the past year, I’ve completely immersed myself in the world of the luxury retailer, taking a hiatus from the high streetwear brands I focused on in the early days days of this blog. Why? Because Gucci’s ready-to-wear collections are like nothing that is currently out there for menswear. Their new Creative Director, Alessandro Michele, has introduced a youthful vibrancy into high fashion and redefined the Gucci Brand. After investing a sizable chunk of my clothing budget towards several SS16 pieces and co-producing HoMs greatest editorial yet, I was given an incredible opportunity: A special invitation to an private event in during New York Fashion Week. As you can imagine, my initial reaction was: !@#!@#!#@!$!$!@! Normally, you have to be a fashion journalist, a celebrity, or a major client to get into these types of events. But somehow, someone 😉 got hold of the blog and Instagram account at Gucci and they wanted to show their appreciation for my work and my loyalty to the brand. Along with the invitation, I was notified that I’d be getting the VIP treatment, with Gucci generously housing my stay. I was also told I would get to meet Trevor “Trouble” Andrew, the brain behind Gucci Ghost, one of the hottest fashion collaborations of the year. The trip began with an 8:45am flight to Newark. I invited Eric Ford, who I collaborated with on the Gucci editorial along for the ride. I wish I could have taken everyone who worked on the Gucci editorial! We flew out of IAH, Houston’s main airport, in first class! Flight time was about 3 hours and 45 minutes, so I used the time and catch up on some well-needed rest to prepare for the big night. Upon landing, we were picked up by a car service, and our driver Jacob greeted us at the airport. I was overwhelmed at the level of treatment! Gucci really knows how to take care of its customers! Greeted by our driver, Jacob! I was like a little kid, excitedly looking up NYC skyline. It was my first time to the city in a couple of years and I was anxious to go out and explore. After a scenic drive into Manhattan, we made it to the 1 Hotel, a luxury 5 star hotel located right across from Central Park. Upon entering the suite, I saw a wonderful note (that I am going to frame) from Franck Grandidier, Vice President of Retail of Gucci North America, welcoming us to NYC! Gucci also gifted us Gucci Ghost wallets! I am so grateful they gifted us the wallet, as I’ve had my eye on this accessory since it debuted. After settling down, I set out my outfit for the evening. I went with the “Life is Gucci” jumper along with my Princeton embroidered fur slippers. Ain’t no party like a Gucci party! Once we were settled in, we were picked up and driven to the Gucci 5th Avenue flagship store. 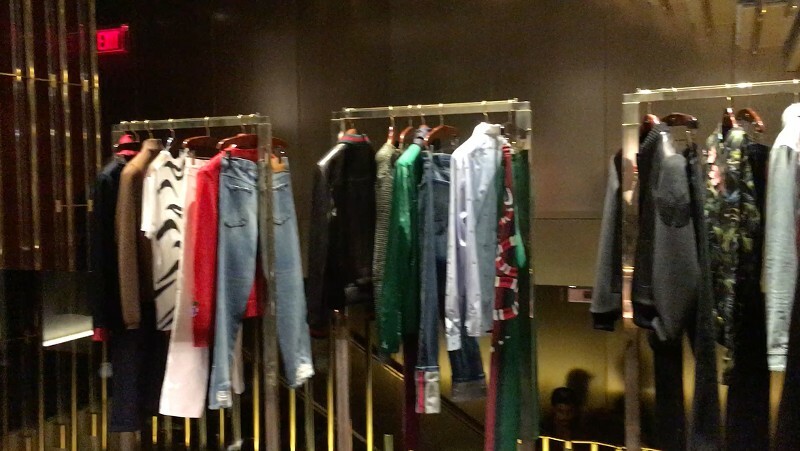 The store is a massive, sprawling 3 floors of merchandise, with leather goods on the first, menswear on the second, and womenswear on the third. 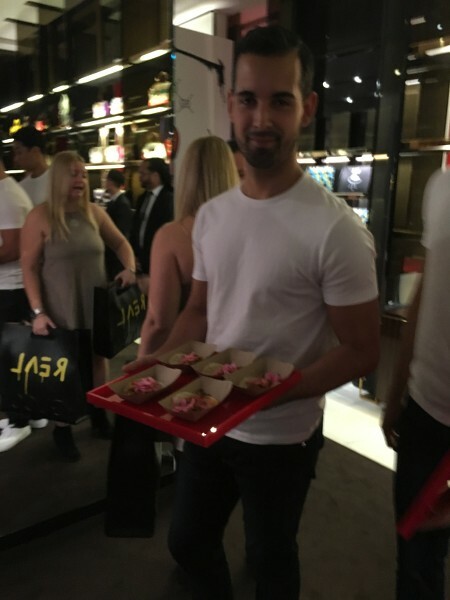 Guests were treated to a Brooklyn style block party with food truck snacks like tacos, burgers, and fries with free drinks. 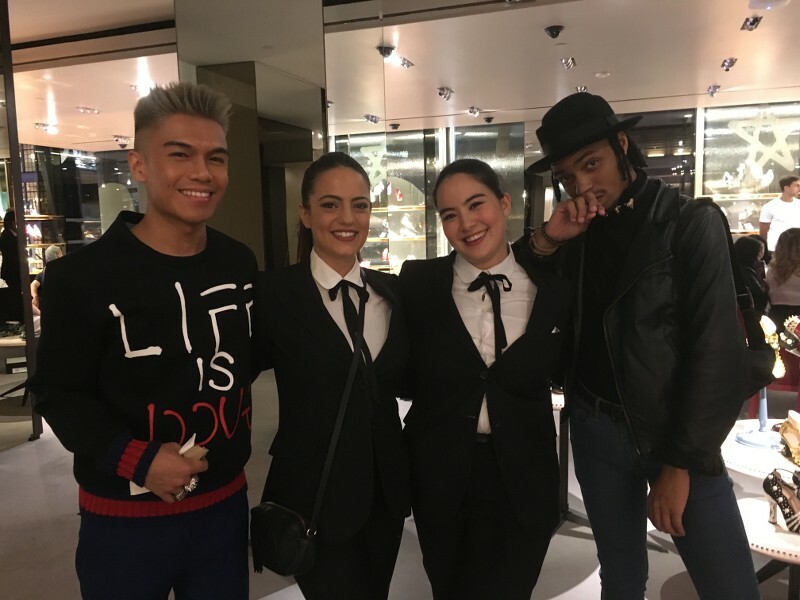 In addition, the store provided a unique shopping experience where guests could shop late into the night and peruse the Gucci Ghost collection (and of course regular Gucci too). 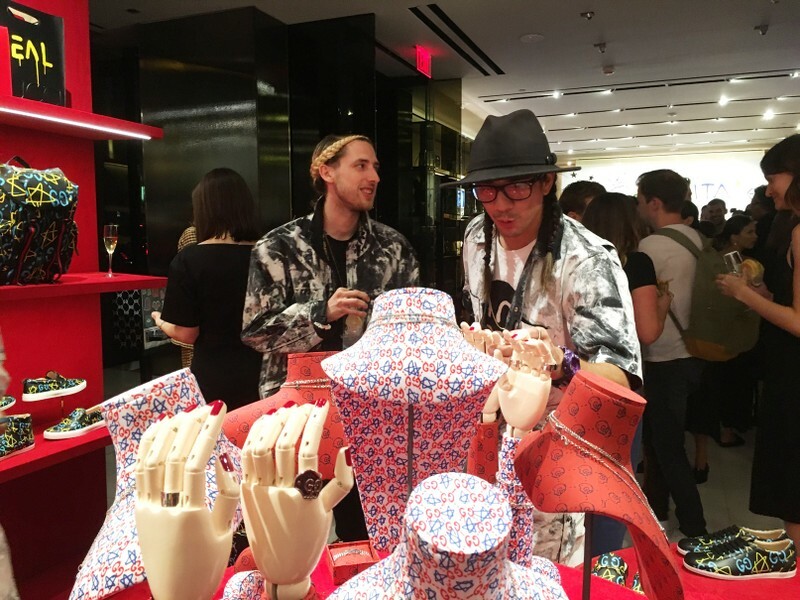 The New York Store boasts the most availability of items of any store in North America, including some one-of-a-kind pieces. What I love most about the Gucci Ghost collection is that it’s a combination of my two favorite aesthetics: streetwear and luxury. They’re two different worlds that you would never think could be compatible. But the magic of Michele’s and Andrew’s collaboration proves otherwise. Andrew provides a bright urban touch to the new pieces that appeal to a younger demographic. The clothes are fun to wear, and the wearer stands out in any crowd. In my opinion, the must-have pieces are: the bomber jackets, the jersey shirts, tees, the “Life is Gucci” jumper, and the slip-on sneakers, which, are the comfiest shoes I’ve ever owned. 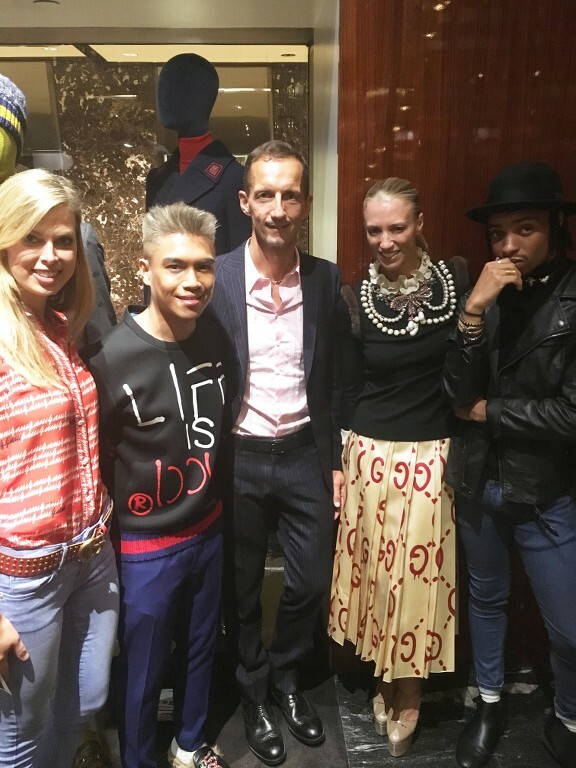 After a few minutes of browsing, I was greeted by Courtney and Mikem who are in charge of advertising and marketing at Gucci North America. We were flattered that they recognized us from the video, and we presented them with a physical copy of the editorial photoshoot as a gift. They kindly gave us a tour of the store. 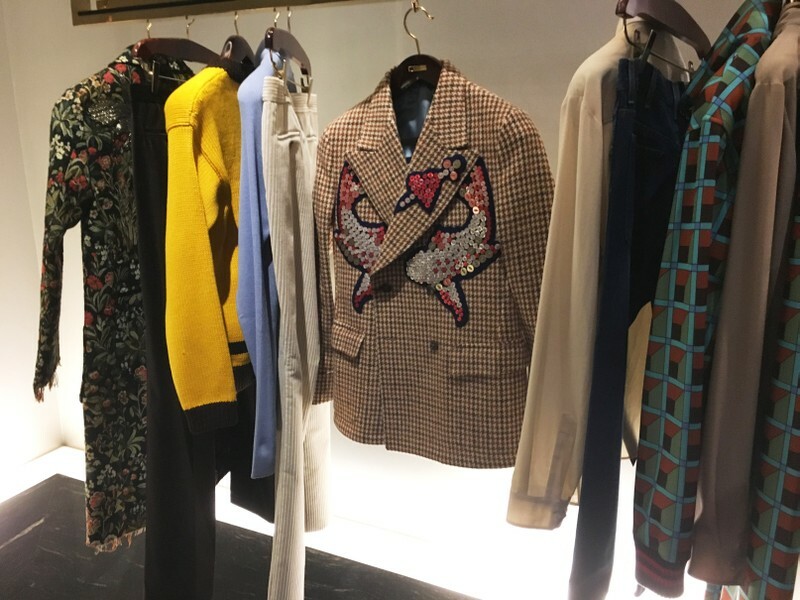 The meanswear floor is the largest I’ve seen in any Gucci store, with racks and racks of pieces from the most recent collections. 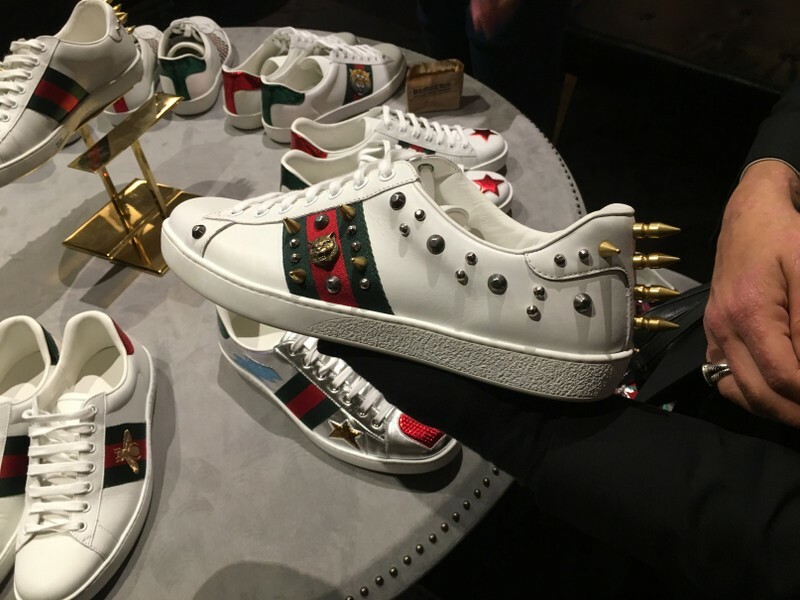 There’s a huge display of Gucci’s entire men’s shoe line! It was literally Gucci Heaven and my wallet was burning! If you’re looking to shop Gucci, I advise you visit the NYC store, as it is the prime location for the must-have items. They’re usually the first in North America to get the newest, in-demand pieces right off the runway. Racks on racks on racks! 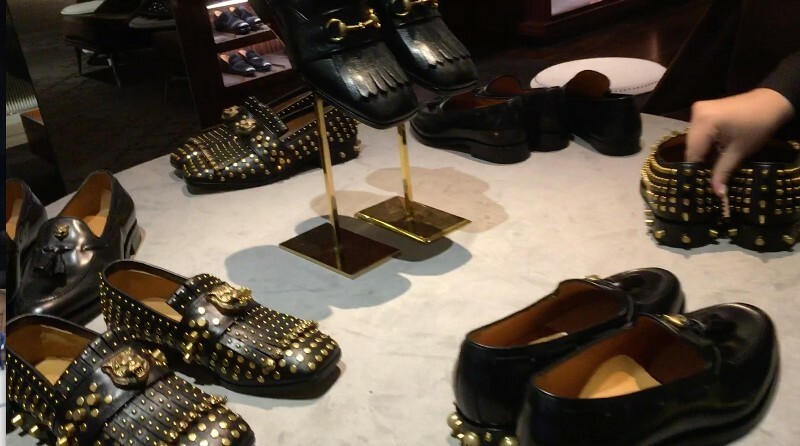 Studded loafers anyone? My personal favorite is on the bottom right, with accented pearls on the heel. NYC has the latest inventory for FW16 shoes. Once we finished touring the store, we walked up the staircases to visit the women’s floor. Like the men’s section, the womenswear floor is stocked with all the latest pieces that haven’t even been delivered yet the stores I usually visit in Houston and Dallas. I was greeted by Annalisa DiMonte, the Worldwide Relational Marketing Director for Gucci. I nearly had a heart attack when I saw her and she knew who I was. She had seen the Gucci editorial and wanted to congratulate me and the team on a job well done. 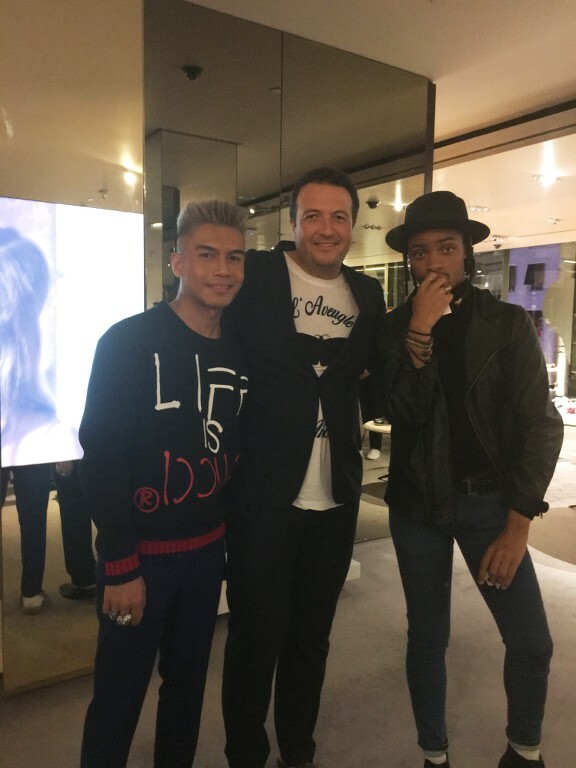 Minutes later, we were greeted by Franck Grandidier, Vice President of Retail of Gucci North America, who also saw the editorial campaign and gave his praises. 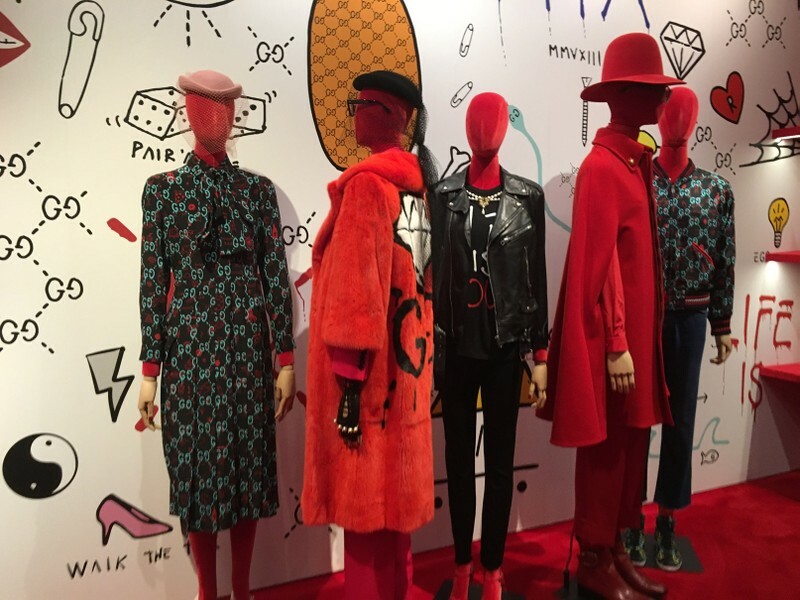 He was impressed by how were able to nail down the idea of what the New Gucci is all about, and how we made our content fit within the Gucci brand. 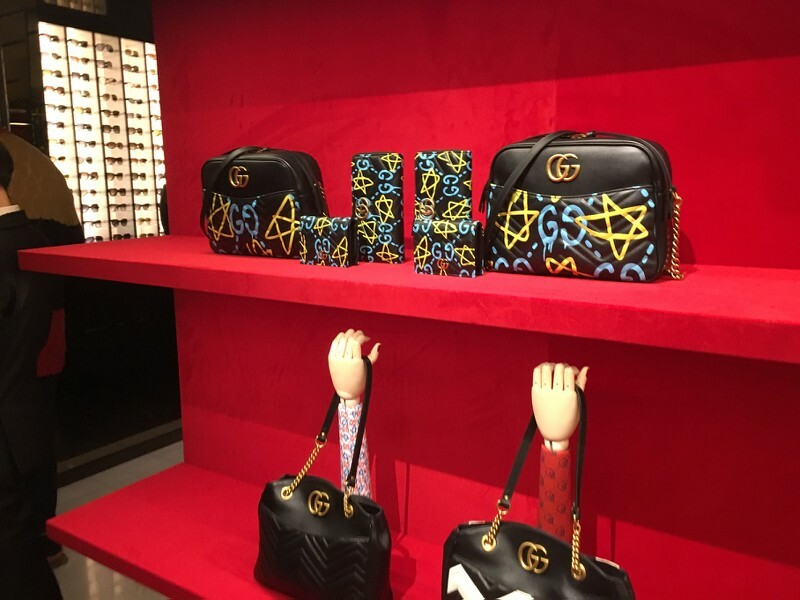 He told us what an exciting time it is for Gucci, and that they are thrilled that a younger demographic is responding so well to the new collections. At this point, I was overwhelmed that so many high-ranking Gucci employees had seen HuesofMan and were praising our work. It brings me so much joy to know that the team behind HuesofMan and the Gucci editorial were noticed and commended by Gucci. As we made our way back downstairs to rejoin the main party, Courtney spotted Susan Chokachi, President of Gucci North America, and Robert Triefus, Global Chief Marketing Officer for Gucci. They too had seen our work and congratulated us for being great brand ambassadors. We spoke briefly about the process of creating the editorial, and they definitely seemed impressed by how we were able to pull off the photographer in less than 4 hours. It was a humbling and life changing moment, knowing that all our efforts were appreciated by the biggest brand in the world. As the night ended, I left knowing that this was an experience I will never forget, and that Gucci is a brand I want to stay loyal to. I’ve never seen a brand make such an effort to connect personally to its consumer as this. 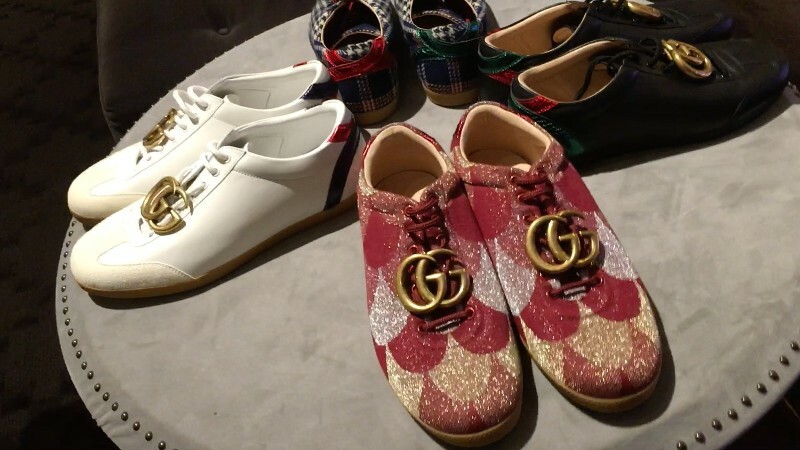 The night was the apex of my year-long obsession with Gucci, and a testament to the magic that forms when a consumer falls in love with a brand. Gucci went beyond our commercial relationship to give me a memorable experience that has left a permanent impression in me. Thank you Gucci for the wonderful opportunity to be part of your world for a night. And to my readers, continue being inspired and exploring the world of fashion. You never know where it may take you! Ryan, Jony, and Shae for keepin’ the dream alive!